Everyone does stupid stuff during college, but rarely something as reckless as getting married on a lark. The characters in Lekar Hum Deewana Dil (“With Our Joyful Hearts“) take that matrimonial leap and spend the rest of the film paying the consequences. Dino (Armaan Jain) and Karishma (Deeksha Seth) are best buddies, though their university chums suspect that their feelings for one another are more than platonic. Karishma’s father insists that his daughter marry at age twenty-one, citing a vague family tradition as precedent. To save Karishma from an arranged marriage, she and Dino elope on his motorcycle. They get married, but they never actually consummate it because neither of them thought to buy condoms, and they’re constantly on the run from their parents. When they do find a peaceful moment, Dino and Karishma are faced with the realities of married life. They don’t have jobs, they’re running out of money, and they know nothing about how much it costs to run a household. Practical pressures strain the couples’ relationship, and Karishma calls the road trip off when she is forced to poop in the jungle. The second half of the movie deals with the fallout from the elopement. The focus on practicalities that dominated the first half disappears, and the second half centers more on whether or not the couple is destined to be together. Given the tenor of the first half, whether the couple is meant to be together isn’t of utmost importance. The question is whether they are ready to be together, but Lekar Hum Deewana Dil glosses over that. By the end of the film, Dino and Karishma are mostly unchanged from the privileged, immature kids they were at the beginning. That’s not to say that Dino and Karishma are bad characters. They just don’t evolve. If anything, they devolve, spending most of their time after the interval screaming at each other. Jain — who looks like a young clone of Saif Ali Khan — and Seth are competent, but they’re not asked to display much range. Few other characters get much screentime except for Dino’s older brother Dev (Sudeep Sahir), who is fine until a bizarre romantic subplot turns him into a stammering oaf. One of Lekar Hum Deewana Dil‘s selling points is a soundtrack by A. R. Rahman. The music is good, but it’s hard to enjoy within the context of the film. Director Arif Ali favors jerky handheld cameras and claustrophobic closeups on faces. Combine those with quick edits, and the song-and-dance numbers — especially the opening one — become an exercise in avoiding motion sickness. 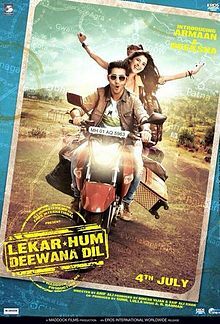 This entry was posted in Reviews and tagged 2 Stars, 2014, A. R. Rahman, Arif Ali, Armaan Jain, Bollywood, Deeksha Seth, Hindi, Indian, Lekar Hum Deewana Dil, Movie Review, Sudeep Sahir, With Our Joyful Hearts on July 7, 2014 by Kathy. Better to skip it. Thanks!